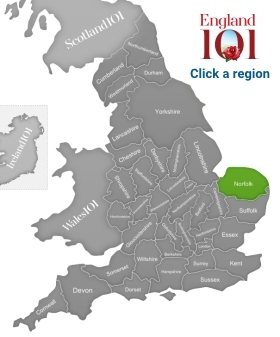 Norfolk, England’s 5th largest county in terms of area, is seated in the far east of the country, in East Anglia, forming the “horn” of England along with its southerly neighbour, Suffolk. Because of its location along the North Sea coast, Norfolk was an obvious arrival point for invading armies, particularly those from Scandinavia who would have found this extensive peninsula first. 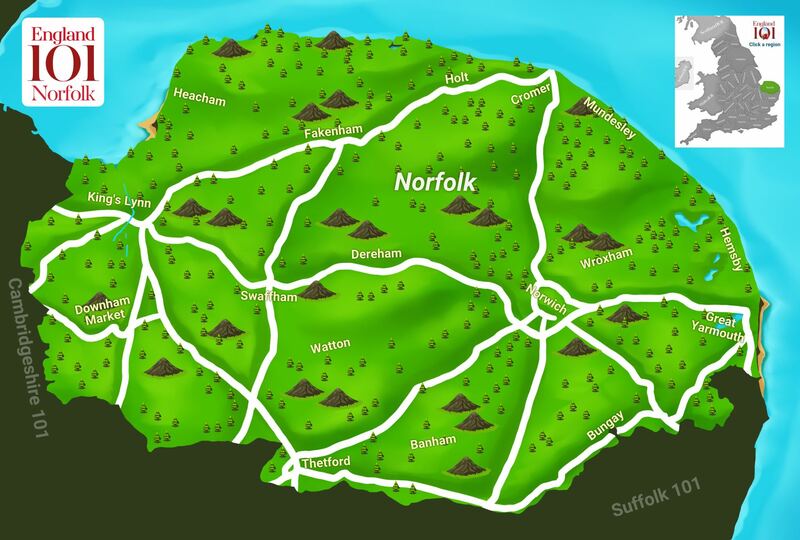 As a result, Norfolk is home to numerous old Viking forts, as well as the remains of early Roman and Anglian settlements. A largely rural county, Norfolk is primarily known for its coastline, as well as inland scenery. A great portion of the Norfolk Coast is a designated Area of Outstanding Natural Beauty. This 450-square-km stretch of coast is home to the Wash, a large square bay near the border with Lincolnshire, which is counted among the largest estuaries in England. Inland, the Norfolk Broads is a huge network of rivers, marshes and lakes, many of them navigable by boat, that are a protected national park. Many photos of the Broads include the iconic Dutch-style windmills that dot the landscape in the area. 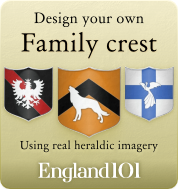 Norfolk has traditionally drawn holiday makers and families, especially to its natural areas and coasts. A number of the Norfolk beaches are situated at resort towns and villas perfect for holidaying. Even the Royals like to holiday in Norfolk at the Sandringham House, which is also a popular tourist attraction. With that in mind, it comes of little surprise that late the Diana, Princess of Wales was born and raised in Sandringham. Other famous people associated with Norfolk include folk-rocker James Blunt, Stephen Fry, who was raised in Booton and continues to live in the county, and travel writer Bill Bryson, who has lived in Norfolk since 2003. 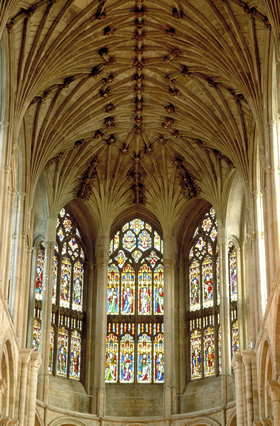 Bosses and stained glass windows in the vault of Norwich Cathedral. 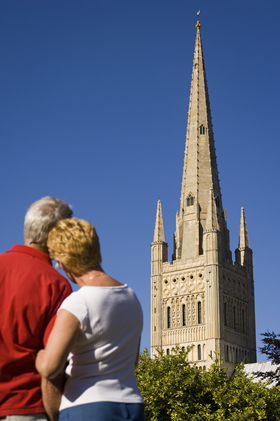 Couple looking towards the fine 15th Century spire of Norwich Cathedral, Norwich, Norfolk. 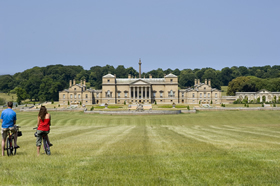 Couple on bikes taking in the view across sweeping lawns towards the grand 18th Century manor house on the Holkham Hall Estate, Holkham Hall Estate, Norfolk. 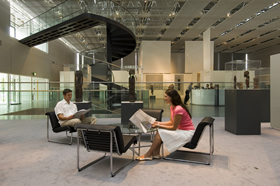 Couple relaxing in the Sainsbury's Centre Of Visual Arts, a public art museum at the University of East Anglia in Norwich. 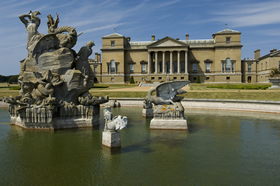 Holkham Hall, a Palladian style country house built in the 18th Century for Thomas Coke, the 1st Earl of Leicester, Holkham Hall Estate, Norfolk. How much do you know about Norfolk ?